Giant Asparagus! Wow eight foot hight so far, amazing! Should have posted this on April first though shouldn't I! 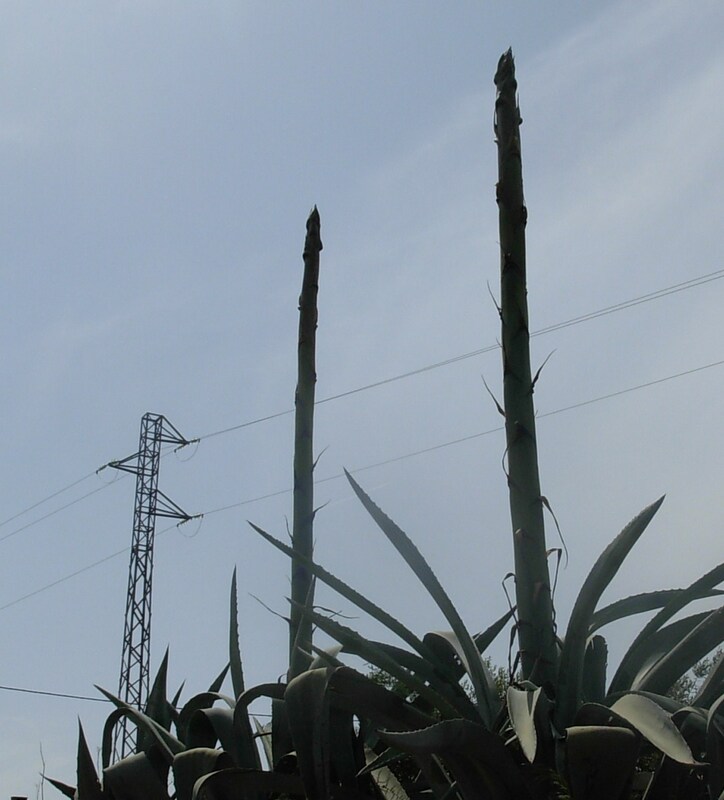 So ok, its Agave! But looking like this? Hay gotcha didn't I!! Today, this evening hospital appointment, I had an MRI, unexpectedly... I knew the department I was going to, but not until we were outside the door with 31 on it, did I find out this was what the appointment was for! Few people waiting, about 45 minitues late getting in, and out just over half hour, mas ó menos! On our way home 7:15pm... Seemed so late to be coming out of a hospital appointment eh! Firstly, after being settled onto the machine the doctor placed an awful thing over my face, like a mask, with a mirror! So although laying down and looking up, I could see my legs and her face on the other side of the glass wall! When she put it on I said.... "Ah, Silence of the Lambs" which made her laugh! Then she wasn't laughing when she came back to me, pulled me back out and took it off, she realised I wasn't having my head scanned! So that was better, horrid thing, the mask.... and the MRI machine, its noisy, sounds like being in a hole with a dozen workmen using those hammer drill things, although it sort of had a tune, now and then... ba ba ba ba, bounce bounce bounce! Sounded like being in a rave, not that I have actually been to a rave, but how I imagine one to be like! Before I go, did a funny thing on the way there in the car, was chatting with friend and was telling her about the bread pudding another friend had made this week, saying it was the best bread pudding I have ever made... and you know when you mix words up? Putting either two words together or swapping the first couple of letters around.... I did that, and will tell you what I said instead of best bread pudding.... Breast pudding!!! LOL, and did we laugh? Yes, for ages!